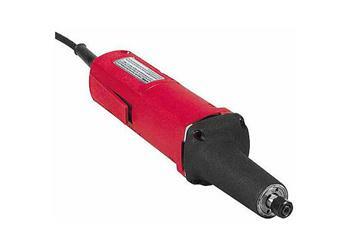 Grinding in tight places around irregular surfaces is the specialty of this Milwaukee Die Grinder. The 5194 comes with a 1/4 inch collet but will accept 1/8 inch collet as well. A full array of mounted points allows you to grind many shapes and diameters. At 21,000 RPM with an 4.5 amp motor, this tool means business. A maximum 2 inch reinforced or 1-5/8 inch non-reinforced wheel can be attached to this versatile grinder for deburring and shaping. Paddle switch operated with body grip control.